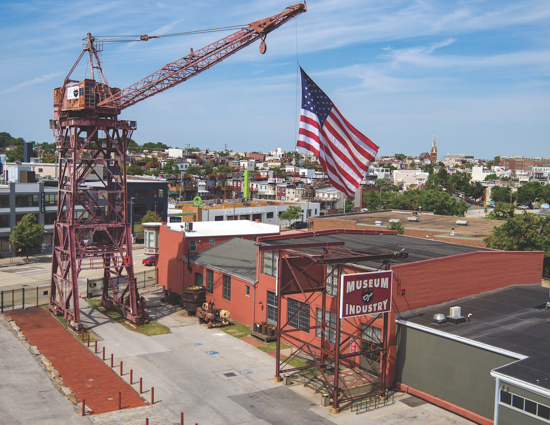 The Baltimore Museum of Industry is a registered 501(c)(3) nonprofit organization. Work. It’s the thing that builds cities. Enacts change. Improves the world. It’s often not easy, not glamorous, not something most take time to stop and celebrate. But no matter the labor, no matter the hardship, there’s a person and a dream worth treasuring under there. Each of us has a skill we aspire to, a commitment we believe in, a gritty determination to make a tangible, positive impact on our personal lives and maybe the lives of many others through our work. From the earliest age, the work we do is what we imagine will define us one day—perhaps even more than the family we might have or the place we might live—it’s what we hope to explore, create, grow, fix, build. So it is out of this same forward-looking industrialism that the Baltimore Museum of Industry was born. Set right on a thriving port that once served as a conduit to the world, our museum inspires tomorrow’s worker by celebrating yesterday’s worker. Just like these real people doing real jobs, we’re not varnished or slick or Hollywood. We’re an uncommon look at common working men and women who literally laid the groundwork for everything that Baltimore is and can be. We champion our region’s fierce entrepreneurial spirit and the legacy we can all leave. We strive to be a rally cry for anyone who is ready to be just as industrious, just as brave, just as innovative, and just as dedicated to doing the things that turn a great city into something greater.